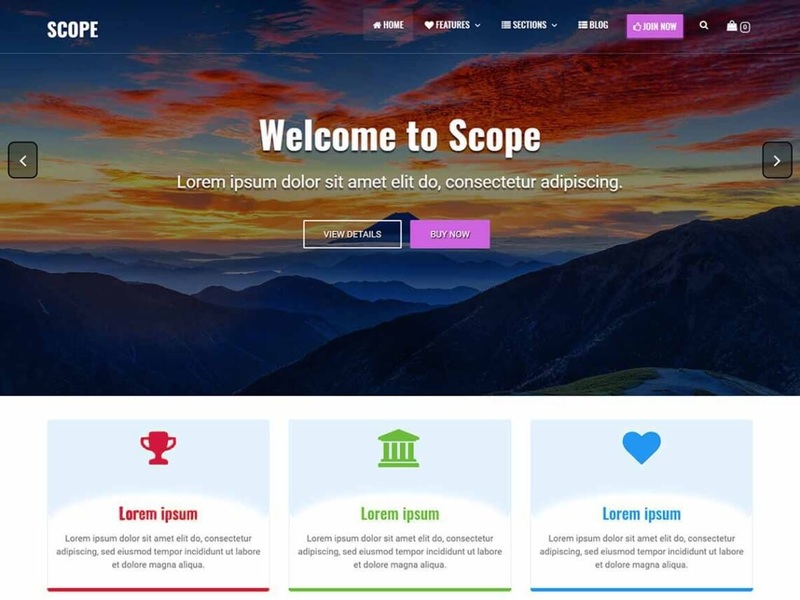 Scope is incredibly flexible with a modern WordPress theme for professionals. multipurpose WordPress theme that can help you create an amazing website easier than ever, by drag and drop. fully customizable and beautiful theme suitable for blog, personal portfolio, business website, and WooCommerce storefront. Scope help you create any type of websites like a creative business, restaurants, wedding planners, sport/medical shops, startups, corporate businesses, online agencies and firms, portfolios, e-commerce (WooCommerce), and freelancers. You can edit the settings on tablet and mobile so your site looks good on every device. Work with the most popular page builders as Elementor, Beaver Builder, Visual Composer, Divi, SiteOrigin, etc. You can set menu icons and use Mega Menu. The theme is Responsive, RTL, Translation, WPML and Retina ready, SEO friendly, and uses Bootstrap 4 and FontAwesome for design.